McNary senior Beau Reitz was nervous the first time he played the national anthem on the violin before a Lady Celts volleyball game. Reitz has since played the anthem four more times, before wrestling duals and basketball games. He first picked up the violin in the fourth grade when Bruce Purdy, then the orchestra director at Claggett Creek Middle school, came to his elementary school and played all of the different instruments. “I just really loved the song he played on the violin and had to play it,” Reitz said. Reitz began taking private lessons in the sixth grade with Evan Roth in Salem. He now plays in the chamber ensemble and advanced symphony at McNary. 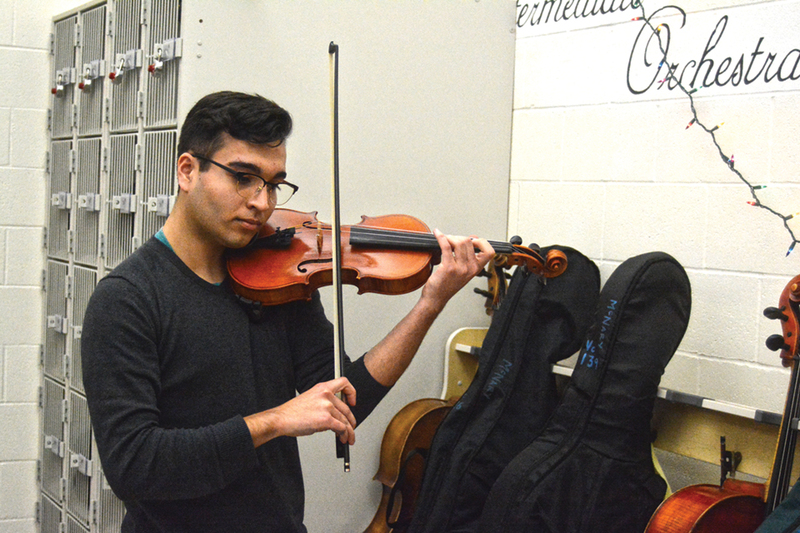 Reitz primarily plays classical musical and is working on Chaconee in G Minor by Tomaso Vitali for the Oregon Music Education Association District 4 competition on March 10 at McNary. He’ll also use the piece to earn scholarship money. Reitz has been accepted to Georgetown University, University of San Francisco and Seattle University. He’s learning towards Georgetown, where he would double major in music and political science. Reitz’s interest in politics started last year when he took AP government during the presidential election. “That was just a really good time to be in that class and I just got really interested,” said Reitz, who has no interest in running for office himself but might be interested in working on a campaign or going to law school. At McNary, Reitz is also a member of FBLA and president of National Honor Society.